Okay, just shoot me now and put me out of my misery! Will I never achieve such creative genius as this? Time to read it and weep…not the ugly cry – it’s a happy sob (sigh)! Oh what some people can do with a recycled book or two. Like this painting on a wall of books! A wall of books! This work is a jaw-dropping WOW for me! And I am having some serious BLUST over the thought of having a wall like this in my home. You’ve got to check out more from Mike Stilkey and admire his talent. A HUGE thanks to Mike for giving me permission to re-print his images. There are other repurposed book finds that have also caught my attention lately. 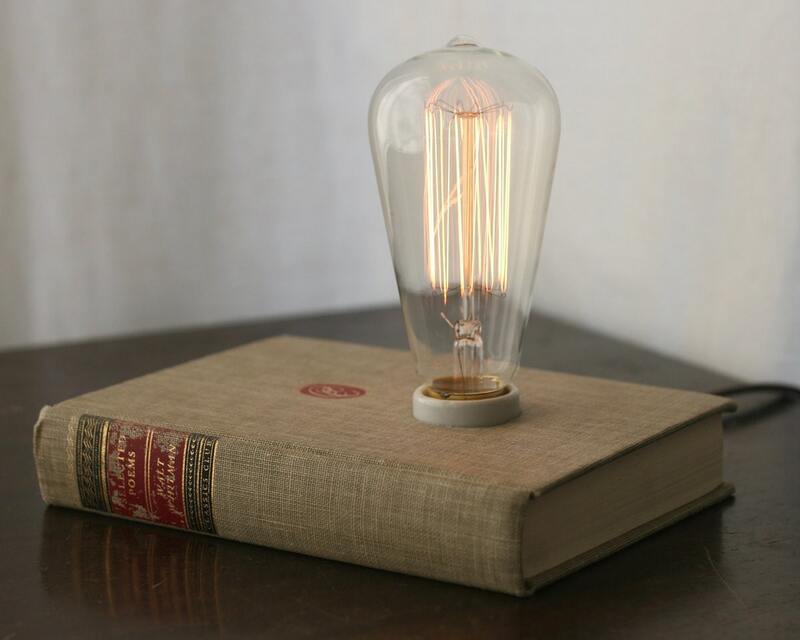 Like this single bulb lamp from Typewriter Boneyard (Etsy) – I’m sure even Edison would approve. I absolutely adore this idea, and it sparked an idea for me to try using a book to hide all of our unsightly computer cords in our currently-under-remodel-construction office. Let’s see if I can bring it to fruition. 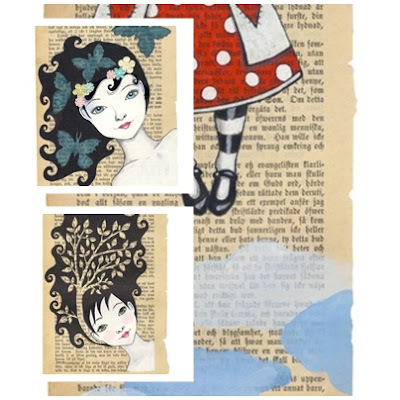 Marcy Bates with Recycled Reads (also on Etsy) used to own a book store – which may be where she fine-tuned her skills of turning books into typographical works of art. I’m a huge fan of using book pages for art and illustration – and one of my favorite in this genre is Carambatack Design out of Norway. Her art draws me in, and when she offers them on vintage Norwegian book pages they become even more spectacular. I can’t even choose just one to show you – that’s how much I love them. This is definitely something I would carry! I LOVE the worn edges of this – appears to be a woven book cover. What a yummy blue color from Spoonful of Chocolate (Etsy). You might remember these perfect little repurposed book shelves that I featured in the Repurposed DIY for Everyone post. Definitely a showstopper! Favorite places? Why not take your travel books and turn them into hanging racks that welcome you each time you return back home? A row of three books would be lovely in a long, narrow entry, don’t you think? This idea comes to us from Lockengelöt in Germany. You really must see the work of Littlefly to believe it. 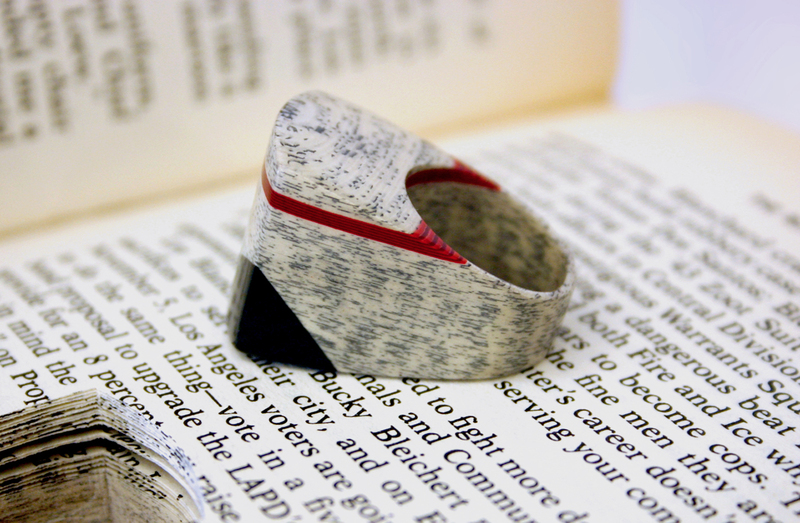 Using a special laminating process, Jeremy May turns hundreds of book pages into beautiful pieces of jewelry. Another jaw-dropping WOW for me. 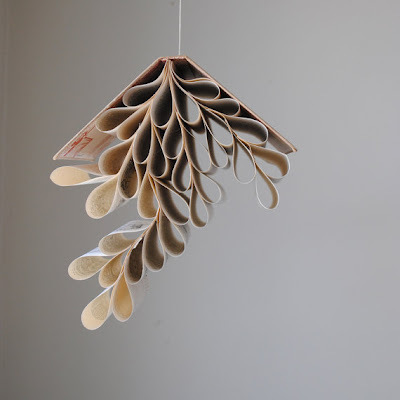 Bomdesign gives us the boeklampen, Dutch for book lamp – another repurposed book to ponder…in the form of this hanging lamp. While we are on the subject of fabuloso repurposed book lamps, check out this chandelier from Lucy Norman, the genius behind Lula Dot. She’s a repurposer after my own heart. It was included in a repurposed lights and chandeliers post in May. 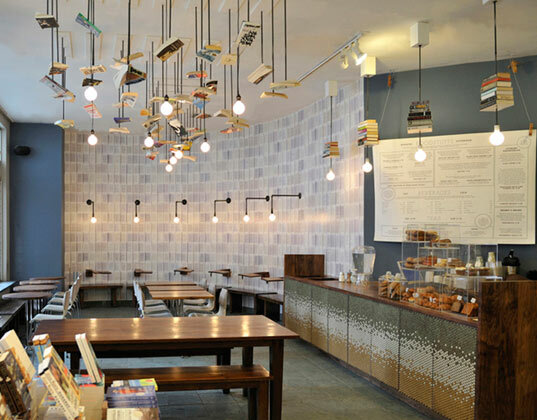 I’m also lovin’ the use of books in the McNally Jackson Books bookstore (via Inhabitat). I don’t have the high ceilings…but wondering if there is a way to adapt the idea for our office remodel at home. You’ve most likely seen this one as it gained quite a bit of media attention. 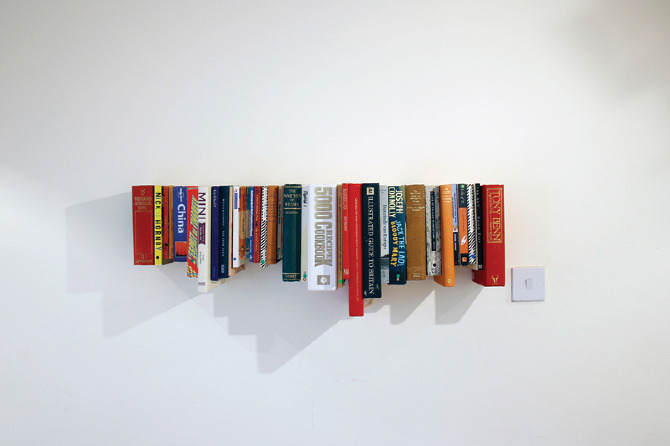 Nevertheless, I can’t leave out this lovely recycled book shelf by not tom. I find the lines quite pleasing. I do love the designs created by these hanging book mobiles by Lisa at Shop House (Etsy). We shouldn’t forget this book spine box by Able + Baker (via Pinterest). It would be perfect on a bookshelf for extra storage. What I absolutely love about this library book counter at TU Delft Architecure Bibliotheek in Holland (via Flip Flip Me Heidi) is that they’ve turned the books around and the viewer has a softer palette of muted color from the book covers. The blend of colors visually actually reminds me of the junk mail art piece posted earlier in August. Or what about this pillar in the Ex Libris book store (via Eco-Artware-Notes)? Something to adapt for the home? Could be a great table base. And finally, I’m not sure that it could be a DIY project for the masses, but this streaming books installment by Spanish Alicia Martin (via A Reader’s Respite) will certainly capture your attention. I’ll be keeping track of these DIY book projects and more on a dedicated book board at Pinterest. Let me know if you have a good repurposed book project to add. Now I leave you with this thought. Books that are no longer needed might still have their own purpose. You just have to use your own imagination and be creative so that you can have more wonderful ideas on how you can still keep them. Great post for a bookworm!! I particularly enjoy the drawers with book spines on the front. It would look great on a book shelf if you need extra storage. I have seen something very similar on Etsy before, but it seems simple enough to make myself. Thanks for sharing these great ideas! Great! I'm going to try making a book spine box out of old books. 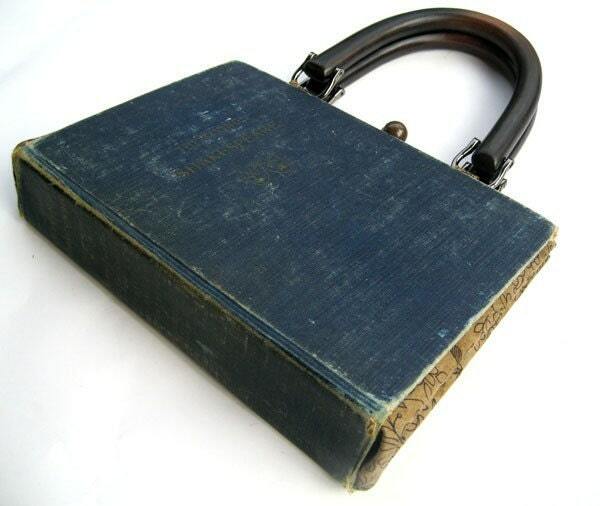 Some great uses of otherwise unused books. Truly inspirational and innovative ideas. Great design work! These are awesome! I was oooing and ahhhing with each picture. 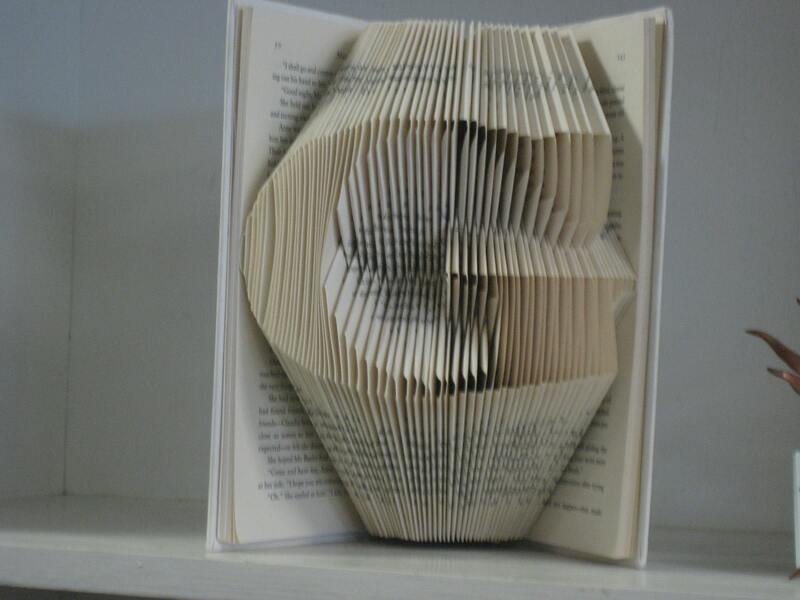 Love book art. Taylor – Does it help to know these books were most likely from thrift stores and would end up in landfills eventually? There is major purging of thrift stores on a regular basis. Yes, I agree it is a bit disheartening – that's why I like the idea of reusing what's already here. Lovely finds and features! Amazing stuff.